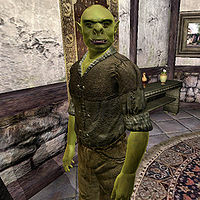 Maknok gro-Coblug, an Orc commoner, is the groundskeeper at the Riverview in Cheydinhal. His wife is Rogmesh gra-Coblug, the Riverview cook. Due to a bug, Maknok never sleeps and instead spends all night wandering Riverview. At 6am heads outside to patrol the grounds near the well. He stays there for a whopping ten hours before returning to the house. For the rest of the day he wanders around inside, and at midnight he settles down to a late two hour supper. Once he's finished eating, he will spend the rest of the night wandering around the house. Sundas is his day off; he will end his shift outside early, after only three hours work. Instead of going back inside he will head to the Newlands Lodge, and will spend the whole day socializing with the other regulars. At 11pm he departs, and arrives back at Riverview in plenty of time for his supper. Maknok wears a lower-class outfit consisting of a burlap vest, sack cloth pants, and a pair of clogs. He carries the key to Riverview and a small amount of gold. He will introduce himself with "I'm Maknok gro-Coblug, the Riverside [sic] groundskeeper. Rogmesh, my wife, is the cook at the Big House." If you ask him about Cheydinhal he will tell you "It's a grand house, Riverside [sic], and they have grand parties there. All the rich swongs and swells of the town come in. Leave a right mess, they do." Maknok is supposed to sleep from 2am to 6am in the basement, but his default wander package takes precedence.